Sue MacGregor is joined by some of those involved in the international relief effort mounted in response to the famine in Ethiopia in 1984, culminating in the Live Aid concerts. 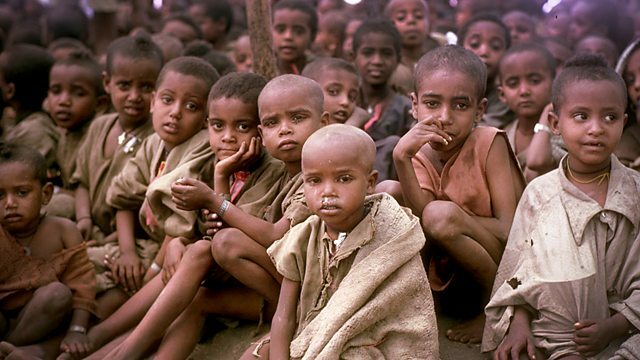 In Ethiopia, close to eight million people became famine victims during the drought of 1984, and over one million died. The international relief effort that followed was the largest ever mounted, culminating in the Live Aid concert in 1985. Reporter Michael Buerk, nurse Claire Bertschinger, former head of Oxfam Hugh Goyder, Major Dawit Wolde Giorgis of the Ethiopian relief effort and Sir Brian Barder, Ambassador to Ethiopia at the time, join Sue to recall the events.